Pipette Stand :- For keeping 12 pipettes in horizontal position made from wood nicely polished. Superior quality. Glass Agencies EROSE are manufacturer of Micropipette Stand. Available: For 94 pipettes( rotatory)in available also. 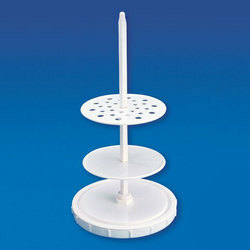 So as to attain immense level of customer trust, we are betrothed in delivering Vertical Pipette Stand. 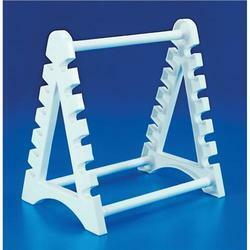 - This is a stable, non corrosive & detechable stand which can hold 28 pipettes with dia.14 mm. - Heavy base measure 225 mm in dia. and square rod 375 mm in length is screwed into the base. - The Arrow provided on the discs should be kept parallel to ensure that corresponding holes are being centered. With the constant support of our dexterous team of professionals, we are fulfilling the varied requirements of our clients by offering optimum quality Pipette Rack. Our Detachable Horizontal Pipette Stand can hold 12 pipettes, 6 on each side, in a horizontal position. Moulded in Polypropylene, the Autoclavable Horizontal Pipette Stand has two sides that are attached with each other with three metallic rods coated with Polypropylene. Our Horizontal Pipette Stand can be easily disassembled for space saving storage.